ISSpresso: Let there be Coffee…in Space! « Adafruit Industries – Makers, hackers, artists, designers and engineers! ISSpresso: Let there be Coffee…in Space! A typical Lavazza espresso machine weighs just under 30 pounds. The ISSpresso (which brews with pods, like a Keurig machine) weighs about 50% more. That’s because of the additional tweaks required to be ISS-compliant. For instance, the plastic tubing that normally carries water inside the machine had to be replaced with a steel one that can resist pressures in excess of 400 bar. 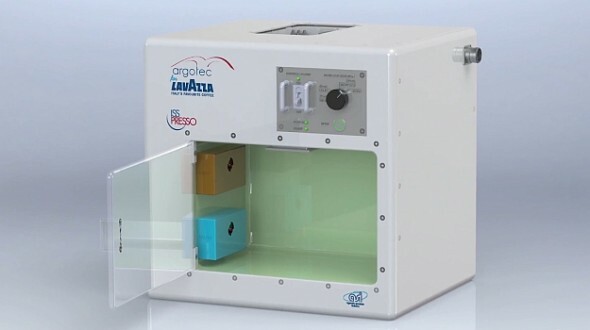 Extra precautions had to be taken because of the high temperature required to brew and the fact that there’s liquid inside the machine… and the last thing the crew of the ISS needs is globs of liquid floating around near sensitive equipment when something fails.